Updating the printer's firmware is recommended for all users as every new version brings new features and bug fixes. 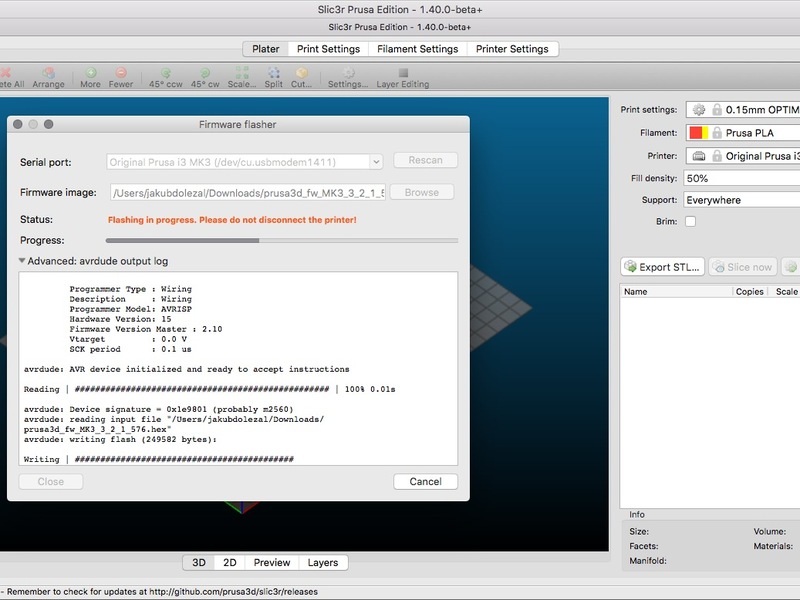 To flash the firmware into your printer, you need a computer (running on Windows, macOS or Linux) and a USB cable, preferably the one, which was included with your Original Prusa i3 printer. To flash the firmware into your printer, connect its motherboard (RAMBo) to your PC using a square-shaped USB-B 2.0 cable. To flash the firmware into your MMU 2.0 upgrade, connect the MMU2 control board using a MicroUSB cable to your PC. To check which firmware version you have in your printer, power it up and in the LCD menu, go to Support. Scroll down and you will see the firmware version.